When our body begins to relax, are manifested in a number of processes that allow our bodies to reach that state. A number of biological phenomena allow our muscles to relax and your mind starts the idle state. The way in which our senses interpret reality creates different reactions in our body indirectly, they are the primary means. Our objective is, from interacting with the senses by certain environmental factors, creating a space for relaxing in its most pure, prompting the mind to relax unconsciously. 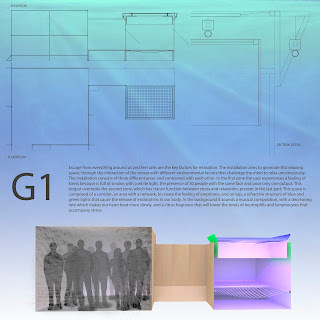 In this way, the user experiences a series of sensations that gradually submerged almost ideal environment for relaxation. To enhance the feeling of relaxation, which one normally accesses after experiencing some stress, we decided to work from within contrast, creating two opposite spaces. -White cubicle full of smoke. 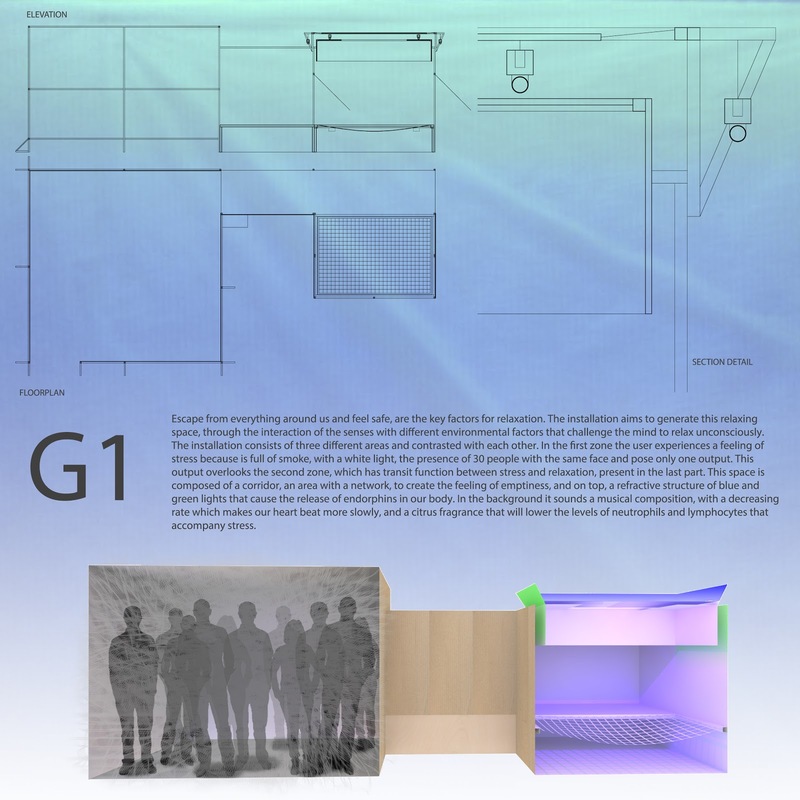 In this area the client will lose the notion of space and experience a strong sense of anguish. -Net to create the sensation of zero gravity. -Indirect green and blue lights. -Sound that decreases its rhythm in order to slow down the heartbeats. After passing through the chaotic zone 1, the client gets to the relaxation area, isolated from the outside, where elements such as the net, citrus aroma or indirect lights will help him reaching a state of mental and physical relaxation.